Not quite kicking and screaming I was hauled along to a gig by Barrence Whitfield and the Savages just over 18 months ago. The gig rocketed straight into my Top 10 of all time! If you’ve not heard of Barrence Whitfield and the Savages before prepare yourself for a band that sounds a bit like Little Richard fronting the MC5 with the Mothers of Invention providing the horn section. Seriously! The album opens with Willow and the crashing guitars sound like they came straight out of the gents windows at CBGB’s and Whitfield’s understated deadpan delivery only hints at what’s to come later. Be afraid children; be very afraid! My favourite track, I’m a Full Grown Man may owe a debt to Bo Diddley for its musical origins; but this song owes a lot more to the Hell’s Fire Preachers of the Southern Baptist Circuit than it does to good old Rock and Roll and I absolutely loves it! There’s more than a nod to Nuggets era Garage Rock on songs like The Claw and Katy Didn’t and that’s meant as a compliment from someone who spent two years listening to nothing else in the 80’s. At times Barrence has a voice that comes from so far down it genuinely is scary; try listening to The Wolf Pack and tell me I’m wrong. The shoorah-shoorah beat is quite intoxicating too, by the way. I’m not sure but Adjunct Street just may be the dirtiest song I’ve ever heard. If not, it’s right down there with the very best. I really can’t wait to see and hear the effect it has on a live audience. 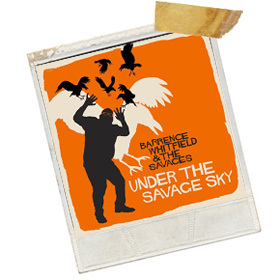 Even sitting in my office listening to Under The Savage Sky I had a sweat on; especially the 100mph 21st Century Rock and Roll of I’m a Good Man and earlier the mouth-harp drenched Angry Hands. Barrence Whitfield is first and foremost a Righteous Soul singer; but not the type you dance to at School Hops; his music is for late at night on the car radio down Lovers Lane. Barrence Whitfield and the Savages must be the foremost Rock and Roll band in the world at the moment; creating the music that Mother’s have warned teenagers against listening too for decades. I might not be a teenager anymore, but my Mother will surely be looking down on me, hands on hips shaking her head as I enjoy this all over again and again.